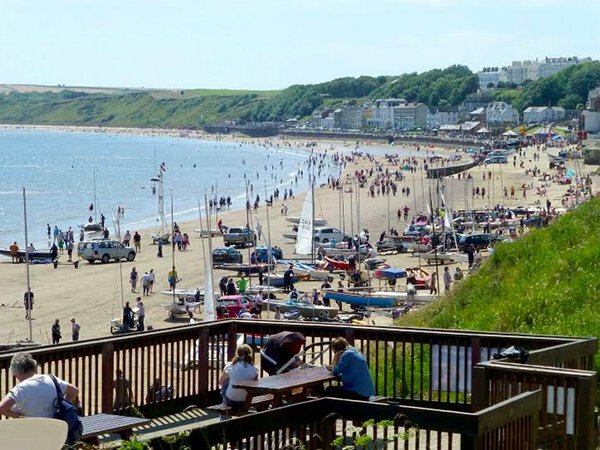 Filey Regatta was held on the weekend of 23rd and 24 June with wind conditions predicted to drop from a F2 / F3 and clocking from the North East to Easterly over the course of the weekend. The race committee welcomed all competitors on the Saturday afternoon and by 1200 as scheduled the fleets launched and made out to the respective ‘P ‘and ‘W/L’ courses. The 8 strong RS Aero fleet made for the ‘P’ course in mid breeze with 2-4 foot swell. The Race Officer set the ‘P’ course with the w/w mark just under the headland with the tide swirling in a clockwise direction about the mark. With swell and mixed chop affecting the first windward leg the fleet was closely matched with Ian, Nick and Kent in 9 rigs and expecting the wind to drop, the remaining fleet looking pretty in the swell and the on/off breeze in their 7’s. Ian Mac’ got away sprightly off the line with Dan Phillips chasing hard and heading out the port side of the course. With Kent and Nick chasing Ian and Dan hard to the first mark, the rest of the fleet were all in close contention. On the first leeward leg Ian had started to open a lead with the fleet all close behind, by the time we were past the spreader Kent made a school boy error in an attempt to catch Ian and took a dunking. Recovering quickly only to loose two close places, regrettably to the competitive pairing of Dan Philips and Steve Stewart in their 7’s. With the breeze still keeping up and the swell holding the next beat followed a similar pattern to the first with a nip and tuck between Kent and Nick Craven chasing Ian and trying to pass Dan and Steve in the 7’s. It was all a close affair with Paul keeping in close contention with Dan and Steve, while Julie and Jackie were having their personal battle for positioning and looking to overcome the effects of the swell. By the 3rd lap Ian was a clear winner on the water, Kent only just recovered back to get in front of Dan and Steve but credit to Dan in staying close on the water and the PY clinching first blood for the 7’s. The second race of the day started in similar conditions with the swell and wind dropping slightly. A shorter beat this time and again it was down to the 9’s to pull away and this time getting away from the 7’s. Ian replicated his consistent form and pulled away a strong lead by the 3rd windward mark, the 9’s of Kent and Nick trailing in his wake, the 7 fleet were by now stretched out and it all looked like a forgone conclusion. The reach from the spreader to downwind leg saw Kent close in on Ian and continued to close in on him all the way down to the leeward mark just managing to roll over Ian before rounding and heading out to starboard. Ian tacked in to the port side in an attempt to recover, the breeze continued to drop and the result was a 1, 2, 3 to the 9 rigs of Kent, Ian and Nick. The 7’s came over with Steve holding off Dan and Julie, with Paul and Jackie bringing up the rear. The evening saw the usual revelry and socialising over the Filey dinner and well hosted bar. A camping session at the top of the hill with the other fleets saw a slightly weary aero fleet awaken for day 2and a Sunny windless start to the day. With the AP hoisted we waited for a breeze on the coarse, the light breeze kept tantalising by the shore, but refused to hold consistently over the race course….the wait continued. By 1200 we were launched and making a steady way out to the race course, this is where the previous days decision to opt for the larger rigs looked like it might pay dividends. The first race of the day set off into a light flooding tide condition with the w/w mark clear of the headland. The gun went and all 8 boats were closely packed off the line, the 9’s made a clean break for it and it was a light and gentle first beat. Ian looked to have got the line just right, but the wind shifted right and meant Kent got a lucky lift sitting lower than Ian. Some of the 7’s were forced to tack off in search for a clear lane above and so dropped back in the fleet. The race was a light affair, with the RS Aeros catching the other fleets progressively. The sun shone and the breeze dropped further, but the Aeros kept up their progress with a clear lead by the 9’s on the water with Steve Stewart staying in close contention in the 7. Kent out in front on the last leeward leg got in a tangle with the other fleets and retired from the race leaving Ian Mac to take the win, Steve (7 rig) in second and Nick Craven in 3rd. By this time the lighter conditions meant the remaining RS Aero fleet had a long spread and mixed in with the other fleets. All down to the last light race, the race officer took the w/w mark further out to the East and we set sail in further dropping airs. Again it was a clear break by the 9’s and this time not to be caught by the 7’s. With some careful cover taking from Kent against Ian and Nick on the beats, the final win went, Kent, Nick , Ian in the 9’s with Dan and Steve fighting it out for 4th and 5th respectively. Many thanks to the race committee and fellow RS Aero sailors for a great weekend on the East Coast, a bit of tidal practice is essential preparation for the upcoming Worlds – see you there!